“If you have spent a long time resisting the status quo—whether it’s in art, society, or the political world—what happens when that status quo at last gives way? "A rich selection of excellent graphic literature in this collection of 26 stories that span the heartbreaking to the hilarious to the just plain oddball." "This year’s guest selector, Bechdel, opens with a terrific introduction that digs into the sense of awe felt by many underground vets on comicdom’s recent hyperdevelopment... The picks are a typical mix of heavy hitters in top form (Chris Ware, Joe Sacco, Jaime Hernandez, Jeff Smith), younger art-comics darlings (Dash Shaw, Kevin Huizenga), and a nice smattering of talented newcomers." "Fun Home creator Bechdel selects 27 pieces for this year's Best American anthology, and though a reader can trace her sensibility in some of the entries . . . it's a pleasure to see many odd, gritty selections . . . 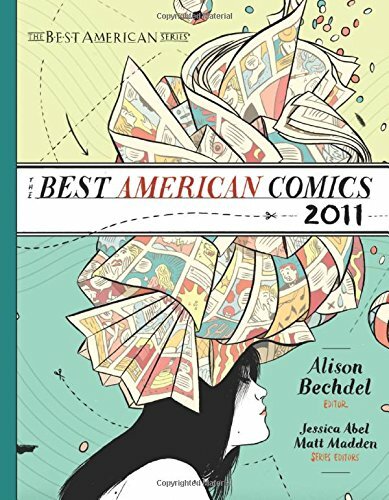 This year's Best American is a handsome anthology with more than a few welcome surprises." "Another annual cornucopia of graphic narrative (and comic strips). Whether comics were ever striving for cultural legitimacy, they are now struggling with it—even resisting it—though this year’s collection suggests that the range of subject, tone and technique continues to expand. Perhaps no other graphic memoirist has achieved greater acclaim than this year’s guest editor Bechdel . . . While much of this work is at the cutting edge of contemporary culture, there is a historical perspective to some of the more ambitious pieces . . .The extended, wordless visual epiphany in 'Winter' is stunning . . . David Lasky shows the greatest range . . . Chris Ware’s inevitable selection is brilliant. The state of an art that has yet to reach stasis." ALISON BECHDEL began drawing the comic strip Dykes to Watch Out For in 1983. She is also the author of the best-selling graphic memoir Fun Home: A Family Tragicomic, which was named a Best Book of the Year by Time, Entertainment Weekly, the New York Times, People, USA Today, the Los Angeles Times, the Village Voice, and the San Francisco Chronicle, among others. Her second graphic memoir, Are You My Mother?, will be out next year. JESSICA ABEL is the author of the graphic novel La Perdida as well as two collections of stories and drawings from her series Artbabe. MATT MADDEN is the author of 99 Ways to Tell a Story: Exercises in Style. Together they are the authors of Drawing Words & Writing Pictures.